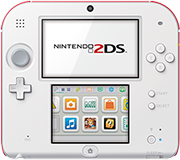 See what your Nintendo 2DS family system can do right out of the box. Discover exclusive games, the digital game store, parental controls, and other built-in features. DON’T HAVE A NINTENDO 2DS SYSTEM YET?